If Darien Harris seems unafraid, it’s most likely a byproduct of the intense determination with which he makes his decisions. 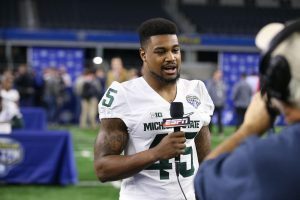 He was determined to become a college football player, and in his senior year he led the Michigan State University team to the 2015 Big Ten championship and the College Football Playoff as co-captain. 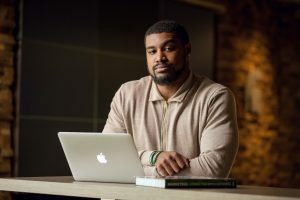 His determination to join the National Football League took him to the Cincinnati Bengals, and when his athletic career ended much sooner than he expected, he determined he would continue his education at MSU. 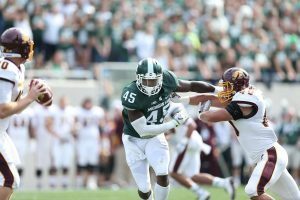 Although Harris is back in East Lansing, he acknowledges that the decision to return wasn’t easy. In fact, Harris did have a space for his return: the Master of Science in Marketing Research program, a nationally renowned postgraduate offering of the Eli Broad College of Business, headed by Jessica Richards. The MSMR program was ranked as the best marketing research program in North America in Eduniversal’s Best Masters in Marketing Ranking for 2018, “which is the best ranking you can get for an MS program,” said Richards, adding the MSMR program is boosted by more than 70 companies on its board – including GM, FedEx, Microsoft, and even the NFL, among other major players – that provide guidance to and recruit from the program. “There’s been a lot of blessings in disguise that have come from [the MSMR program], namely working with such great people like Jessica Richards; [she] has been phenomenal,” said Harris. 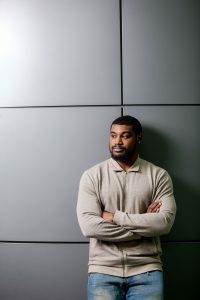 Richards has worked closely with Harris during his time in the program, assisting in the transition between the start of his postgraduate work and the end of his athletic career. “Professor Dale Wilson has [also] had a couple classes that have probably been my favorites in the program, and he’s been really open to me leaving and coming back, and has been incredibly helpful,” said Harris. Wilson has been a professor of marketing at the Broad College for 34 years, specializing in courses surrounding marketing research and strategy. The business realm was quite a change for Harris, whose 2015 undergraduate degree was in journalism. He’s used that degree to build an impressive freelance resume, with on-air work on the Big Ten Network, radio appearances, and more. “For a while that was all I wanted to do, was just be in the media realm … but as you get into it, you realize more of what that entails,” said Harris. He wanted something different. Harris doesn’t seem to be fazed by the challenges of choosing a new career path. In fact, academic success runs in the Harris family. His grandmother holds a PhD in social work and is a retired professor from Virginia Commonwealth University; his mother is an attorney with the Department of Education in Washington, D.C.; and his younger brother is currently attending Yale on an academic scholarship. His background is another reason why Harris has been so passionate about his transition into the research and education realms. 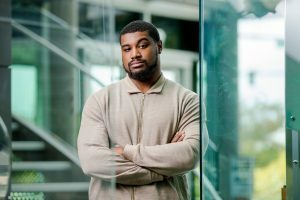 Harris plans to become an education policy analyst after graduation, using his knowledge of research to help improve the public school system.